The fact that my wife Becca was able to join me on this hunt meant more than actually drawing the tag. It was the end of February when I found out that I had drawn a highly coveted sheep tag. I was elated to see my name next to such a tag on the draw results, but for Becca my drawing this tag bittersweet. 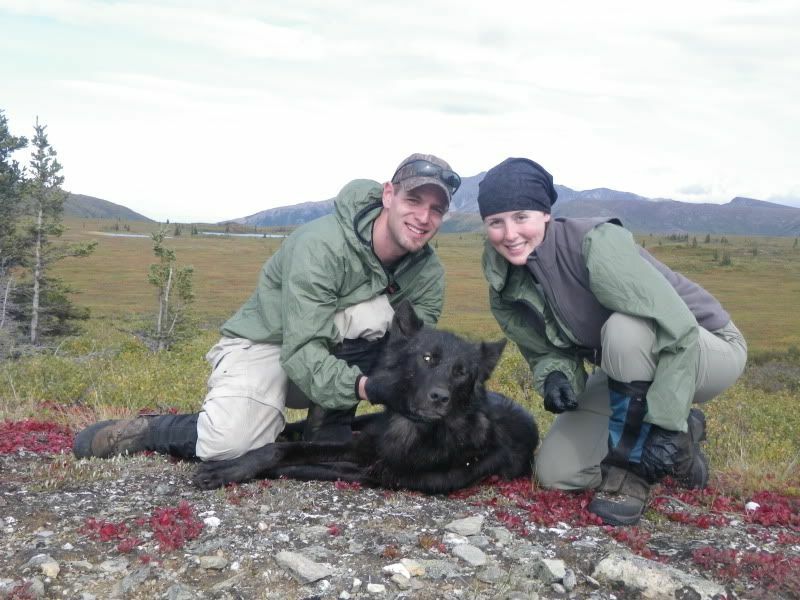 Four months prior, she sustained a fracture to her leg while on a mountain goat hunt in Kodiak. At the time of the draw results, she was still recovering physically and emotionally from her mountain-side rescue by the USCG, and subsequent surgery. While she was thrilled for me, she was tearful in considering the reality that she would likely not be joining me on this endeavor. As months passed, Becca continued with her physical therapy and her fracture healed in no small part to her perseverance at activities like cycling and light hiking. By early summer she was able to trek shorter distances with a reduced amount of weight, and a ready supply of Tylenol. By mid-summer she was packing 40 pounds or more for short 6-8 mile trips. Soon hunting season was upon us. We spent the general season sheep opener elsewhere in Alaska looking to get Becca a sheep of her own. While we did manage to tag out on my caribou permit, we did not find any legal sheep in the 60+ miles we hiked during that rainy eight day hunt. However, we did find that Becca’s leg was proving ready for the rigors of climbing the mountains in pursuit of sheep. The trophy management area where I drew my sheep tag consists of two different seasons, an early motorized season and a later non-motorized season. We wanted to hunt caribou as well as sheep on this hunt, but the caribou hunting takes place during the non-motorized portion, while my sheep hunt was during the motorized season. In an effort to plan around work schedules this meant we would have to go in a week before my sheep tag started. 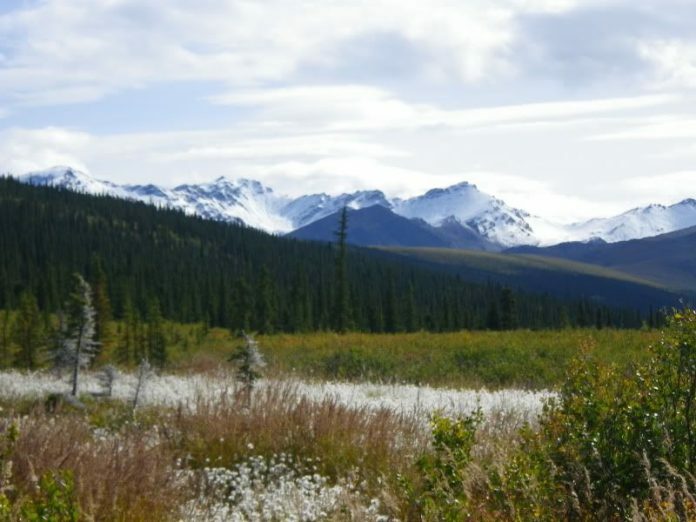 We would use this week to caribou hunt and scout for sheep. this would leave us just one day to hunt for my sheep. We hoped we could find the ram we wanted prior to the start of the season and be in position to take him before the other folks that drew the later season motorized tag could make it in to the sheep ( 20+ miles ) on their wheelers. We planned that after we hauled the ram back to our camp we’d hike out empty, retrieve our six-wheeler, and return to take all our gear out in one trip. If we were unable to connect on a ram the one and only day to hunt sheep together, then I was planning on returning to the area with a buddy, a few days later, to hunt until we filled our tags. August 18th we left the trailhead at 7:30 PM. We traveled several miles towards our destination and made camp just prior to dark (around 11:30 pm in August in Alaska). The next morning we continued the remainder of our 12 mile journey to where we planned to spend a couple days trying to fill Becca’s caribou tag. Just as I gained the last ridge to our intended camping location, I noticed a small black critter cruising the hillside less than a 1/3 of a mile away. I threw up my binoculars to confirm what I already thought: it was a wolf! A few moments later Becca was joining me on the ridge line, and I pointed out the canine moving across the tundra. We watched the wolf amble effortlessly across the landscape as spectators for a minute or so until something inside me clicked. “I can bag this guy if I hustle”, I thought. I told Becca that I was going to try to get over there and take him. I asked if she wanted to join me, but she opted to stay behind to watch my stalk unfold. I grabbed my rifle and began running to a hill 400 yards away where I believed the wolf was heading. 100 yards from the hill I looked to my left and saw a big grey wolf staring at me just 80 yards away! But since I already have a grey wolf hanging on my wall that I took when I was fourteen, I was hoping for the black one. However, I wasn’t about to let a sure thing slip away, as any chance to take a wolf is always a rarity. As soon as I got my crosshairs on the grey wolf I noticed that the black one had joined the grey wolf in the stare down just 5 feet to the left. I quickly took aim on the black wolf and squeezed the trigger. The last thing I saw in my scope was four black paws in the air. Meanwhile, the grey wolf whirled around and was out of sight in no time. Climbing up the hill to locate the wolf I had just taken, I noticed yet another wolf loping away. I felt very fortunate to have run across the three wolves, since I have seen only about twenty or so in the wild in my 28 years in Alaska. Now late afternoon, we decided it was best to setup camp and eat dinner so we could then start looking for caribou. After dinner I opened the door of the tent and looked out to see a cow caribou just 100 yards away. I thought this could be a sign of good things to come, possibly good fortune for taking out one of their predators. 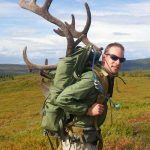 We donned our packs and I had no sooner looked through my binoculars when I spotted a nice bull caribou just over 1.5 miles away. We knew we’d have to hoof it to get over there if we didn’t want to be skinning it out via headlamp. Before long we were seeing antler tips over a hill 500 yards away. We dropped our packs and continued our stalk. When we reached 220 yards, Becca made a great shot on the bull which resulted in taking her largest bull to date. She had shot several caribou prior to this trip, but none of this size. I think the look on her face speaks volumes for how excited she was. After snapping a few pictures we soon had the caribou broken down into smaller, more packable pieces. As we were finished butchering the caribou, Becca dug out our headlamps as I loaded a couple quarters and loose meat into my pack. Ever mindful of her healing leg and the significant distance we had already hiked that day, we opted for Becca to just carry our day hunting gear, as it was obvious that this was a “two tripper” caribou with the meat still on the bone. The hike back to camp was in complete darkness until our headlamps illuminated the reflectors of our tent, letting us know we made it home. 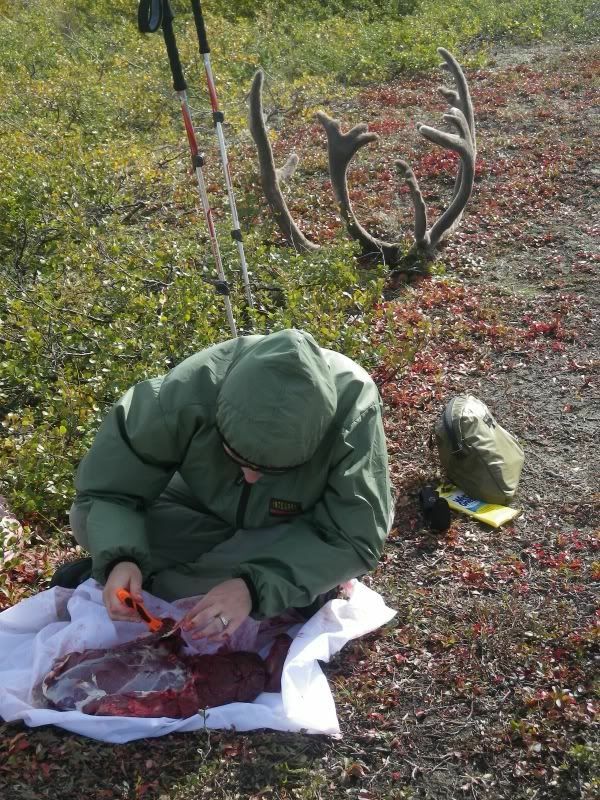 The next morning I hiked over to the caribou kill site to get the rest of the meat and antlers. Becca stayed in camp to begin removing the meat off the bone to lighten our load for the 12 mile hike back to the truck. 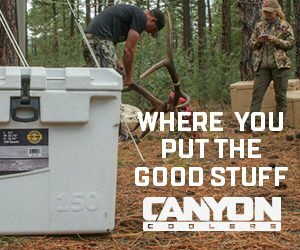 As I returned to camp I unloaded my pack and smiled considering just how lucky I was to have a wife that was willing to get her hands bloody. In the afternoon I packed some of the meat, part of the way out towards the truck. Becca continued trimming and boning out the quarters, and then took a well-deserved siesta. That evening I got crushed in a round of gin rummy in our tent as we sipped on some of the 3 liters of box wine I hauled in. Watch next week for Part 2 of Luke and Becca’s exciting hunt!